FLAC (Federation of Leagues Against Corridas) in France is raising awareness about the cruelty of bullfighting with a commercial featuring a velociraptor. FLAC and its fourteen partner associations ask the question, “Do you think this practice belongs to another age?”, and call on viewers to sign a petition to get bullfighting banned. 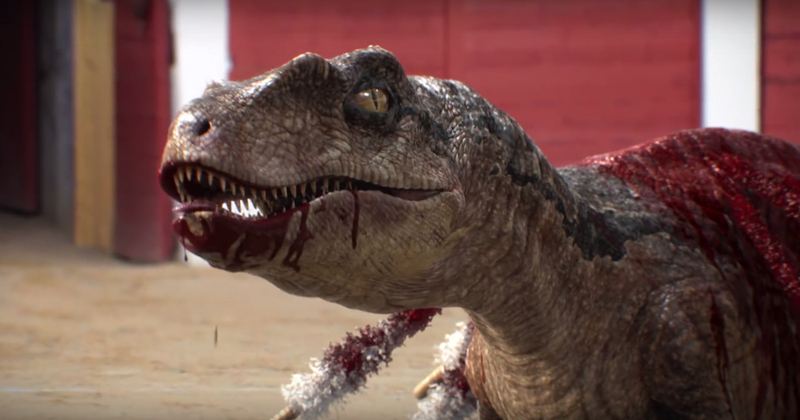 The film begins with the taunting and killing of a velociraptor, suggesting that bull fighting belongs in the dinosaur era. The second half features archival footage from the corrida (bullfighting) culture of southern France and Spain. The answer to the film’s question is “No it doesn’t. It still exists”. The film’s release in French, Spanish, Basque and English, was timed to coincide with the French Presidential election and the run-up to the legislative elections. A recent poll, conducted by FIFG / AAFC in March 2017, shows that 7 out of 10 French people are in favor of banning bullfighting. A French civil code law, passed in February 2015, recognises the animal as a sensitive being that can suffer. Section 521-1 of the Criminal Code severely punishes serious and cruelty to animals, though paragraph 7 permits bullfighting performances with killing when “uninterrupted local tradition” can be invoked. The Bullfighting campaign was developed at BETC Paris by executive creative director Stephane Xiberras, creative directors Benjamin Le Breton and Arnaud Assouline, head of activation strategy Julien Leveque, working with Thierry Hely at FLAC Anticorrida. Filming was shot by director Jean Michel Drechsler via Unit Image. Sound was produced at Yellow Cab Studios.